PLEASE NOTE: The Odyssey Program will NOT be taking place again prior to Spring 2021. For questions regarding alternate options for study abroad programs, please contact Professor Maria L. Fixell, Assistant Provost for Study Abroad and Internationalization, or visit the Office of Study Abroad Programs, 107 Roosevelt Hall. 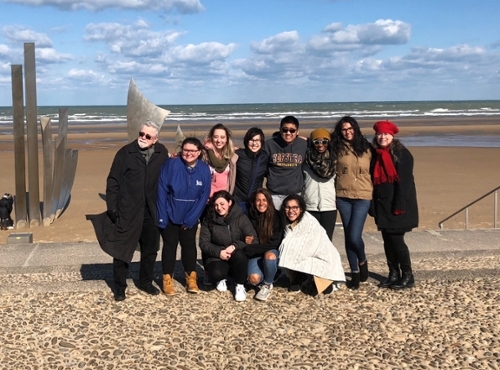 The European Odyssey is a semester-length study abroad program housed in the Department of Global Studies and Geography that is open to all undergraduate students at Hofstra. This unique program, began in 1992 and eventually expanded to become Hofstra's only semester length study abroad program. The dozen selected students and two faculty travel for 10 weeks by minivan throughout Western and Eastern Europe. The mobile classroom setting enables students to experience a rich comparative array of ten diverse countries and cultures. Participants have the opportunity to interview politicians and policy makers, professors and students, as well as ordinary citizens throughout Europe. The focus and itinerary of the program vary each year in order to address events and issues of relevance in Europe and to how Europe fits into the broader context of increasing globalization. The courses examine geographical, historical and contemporary topics in specific countries and regions as well as in Europe generally. European Odyssey, students can receive up to 15 credits from the Department of Global Studies and Geography for the program, which is composed of five three-credit courses. These courses include the Geography of Western Europe (Geog 122, BH), Globalization and Human Trafficking (GS 108, CC and IS),Globalization and Human Rights (GS 109, CC and IS), Urban Geography of Western Europe (Geog 107) and Field Studies in Geography (Geog 180). Both of the geography courses require prerequisites in the form of either 6 sh of prior geography courses or the prior completion of at least one of the following courses: Geography 1, Geography 2, Global Studies 1, or Global Studies 2. Students interested in going on the Odyssey must ensure that they have either taken at least one of the above courses, or that one of these courses is in progress when applying for the program. Prospective Odyssey students should also make sure to NOT having taken GS 108 or GS 109 prior to going on the Odyssey. When choosing students for the Odyssey preference will be given to declared Geography and/or Global Studies majors and minors. Financial aid received by eligible Hofstra students may be used to pay for tuition, room and board. Students must develop patience, empathy, compassion and creative problem solving while living together in close quarters. We often tell students that if they pay attention the 10 week program is the equivalent of 10 years of psychotherapy and a whole lot cheaper! Though much is learned about Europe and the world during the intensive itinerary of the European Odyssey, the program is not just an external journey of discovery. It is also a life-changing excursion into self-knowledge. According to Dag Hammarskjold, a former Secretary General of the UN, "The longest journey is the journey inwards of him who has chosen his destiny." And this is a learning adventure, which indeed helps participants discover their unique individual destinies. For more information about the Odyssey programs, please contact Linda Longmire, Professor of Global Studies and Director of Odyssey Programs, in Roosevelt 209B or at (516) 463-5828, or by email.